Snow: Too much of a good thing? Road and lift closures. Evacuations and residents confined to their homes. The storms that have brought over 7 meters of snow to the Pyrenees since the New Year don’t seem to be putting a smile on ski resort director’s faces. Quite the opposite in fact. Some are asking if they were not better off with last season’s snow drought. Yesterday at Mourtis, a resort where skiers are more familiar with grass and mud, the piste bashers were running non-stop and the upper lifts have barely opened all week. The diesel bills is eye watering. Noël Lacaze, director at Peyragudes, says that avalanche control work has been non-stop. “We’ve already used 900 kg of explosives, we’ve never done that before, that’s between 15,000 to 20,000 euros alone”. 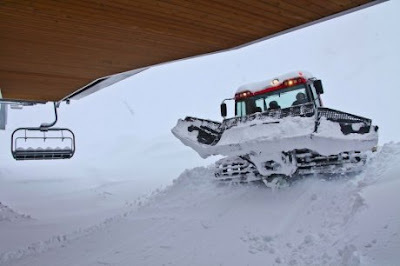 Add to that overtime plus the work clearing roofs and roads as well as additional heating costs and Lacuze thinks snowmaking might be cheaper than dealing with the effects of too much snow. Last season at Barèges there were less than 10 PIDAs organized (general avalanche control days), this season they are already approaching 20. Bernard Malus, director of le Grand Tormalet (Barèges-la Mongie-pic du Midi) says that in recent season they’ve invested heavily in snow making not avalanche control infrastructure. “This winter has taught us we’ve got to put money into remote avalanche control systems, a more performant Gazex network, it will cost around 3 million euros”. Lacaze says that the investment in advanced ski lifts over recent years in the Pyrenees has had an effect “chair lifts are not more fragile but the depart and arrival areas are more complex to clear and secure, with drag lifts things were easier”. It is not as if the resorts have seen an influx of visitors brought by the excellent snow depths. Those resorts which have opened have seen guest numbers at half normal levels. Fewer lift pass sales, fewer skis rented and less people in restaurants. Malux regrets that “turnover is not proportional to snowfall, we need less snow and more sun, but still.... Since mid January we’ve been closed three days and have only been able to sell lift passes at full rate on 8”. The misery is not over for Barèges, 600 tourists were evacuated on Sunday due to the avalanche risk, 24 hours after arriving in the resort. Other resorts have also had to adapt to disgruntled tourists and offer cheaper lift passes or give rebates to guests who already purchased week tickets. The authorities have also been quick to close mountain roads, sometimes for a number of days. Locals also think guests have lost the “mountain culture” and no longer want to bother with putting chains to drive the final km to resort. This Sunday there were further avalanches. A snowboarder triggered a slide in the Port de Castet without causing any victims and there was an avalanche early in the day at Pierre Saint-Martin which blocked the access road. Resort’s comfort themselves that the bad weather has, so far, been outside the main holiday period with resorts relatively empty. Bookings during the holiday period are up, if only the sun would come out.